Family owned since 1880, Opies produce a fantastic range of products that are the perfect accompaniments for cocktails: Cocktail Cherries, Sliced Lemons and Gherkins. Signature lines include English Pickled Walnuts as well as luxury olives, fruits, sauces and compotes. 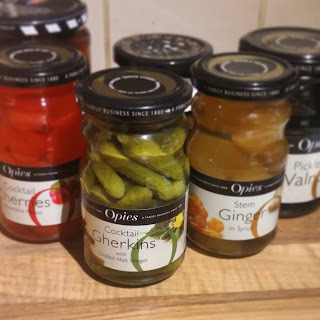 They also have an extensive recipe collection using Opies’ baking items such as Stem Ginger in Syrup, Black Cherries with Kirsch Recipes include Ginger Christmas Cake, Black Forest Cheesecake. The ginger is amazing and has a beautiful fiery flavour, perfect on it's own or in any recipes.